Thanjavur, located in the rich delta of the river Cauvery between Tiruchirapalli & Kumbakonam had been the centre of economical & cultural activities under the Nayaks of Vijayanagar dynasty, Sultan of Bijapur & lastly by Maratha rulers. Though Thanjavur was not the birth place of this art, this style of paintings developed here during the 18th century under Maratha rulers. 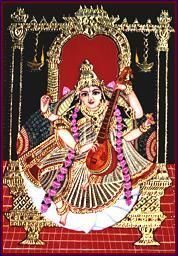 As people & artists migrated to Tanjore from Mysore, Andhra, Bijapur, Maharashtra & Gujarat, the theme & style came to be largely influenced by various schools of arts & religious requirements, also coming under some Western & Chinese influence. Seasoned wooden planks were joined on which paper or a piece of cloth was fixed by using tamarind seed paste. Locally available stone powder & unboiled lime powder were used to prepare the surface. Outline was drawn by tracing the original hand drawn figures. Semi-precious & precious stones, cut glasses etc., were placed to make the jewels for the figure. 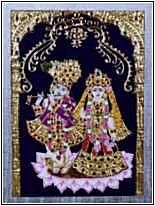 Apart from giving artificial gold colouring, gold & silver leaves were used to colour the costumes & jewellery and other decorative areas. The pigments were prepared using locally available natural materials. The artists favoured bright luminous colours as the paintings were originally meant to be kept in poorly lighted rooms, temples, mutts and homes for worshipping. 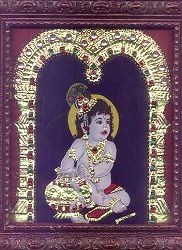 Tanjore style paintings are also drawn on glass by using different techniques. 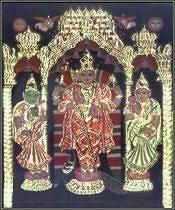 The characteristics of the Tanjore paintings are its brilliant colour scheme, decorative jewellery with stones and cut-glasses & its chubby larger-than-life figures.